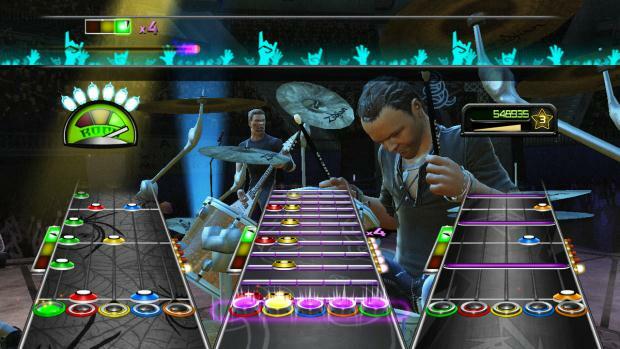 Short Version: If you’re a Metallica fan, this may quickly become your new favorite game. Drummers, too, will find the new Expert+ mode with double-bass pedal compatibility a welcome addition to the Guitar Hero series. In less than a minute of playing Guitar Hero: Metallica, I was thirteen again — sitting behind my beloved drumset in the basement of my childhood home, cursing my Sony Discman for skipping while I was trying to play along to Sad But True on Metallica’s Black album, the first compact disc I ever purchased with my own money. Perhaps I’m not the right person to review a game like Guitar Hero: Metallica. The band was with me through my formative years, I’ve been to three of their concerts, and, whether he knew it or not, Lars Ulrich basically taught me to play the drums. I am truly a child of the Metallica era. Few bands had been as influential on me as I was learning to play instruments, so to have most of their songs in a single video game is phenomenal. Perhaps if and when Guitar Hero: Nirvana and Guitar Hero: Green Day come out, I’ll have a couple new games to gush about. So if you’re into Metallica (or were into Metallica growing up), then you can stop reading right here and go pick up the game. You’ll love it. And if you’re a drummer you may also really like the game, as you can hook up a second bass pedal and rip through classics like One, Dyers Eve, and plenty of other tracks that’ll have you feeling like you’re running in place at breakneck speed. The new Expert+ difficulty level for the drums is amazingly challenging and ought to keep even the best drummers occupied for quite some time. If you’re a drummer who likes playing Metallica songs, I can tell you that this game justifies the purchase of an entire console and Rock Band drumset. Seriously. Most of the games “features” won’t really appeal to anyone but true Metallica fans, so if you’re not into Metallica you’ll probably want to skip this one. It almost plays like an expansion disc or a big track pack that costs $60. For fans, there are some nice motion-captured graphics of each of the band’s four members. Lars stands up and pounds on the toms during Creeping Death, James pumps his first into the air to get the crowd all riled up, and bassist Rob Trujillo does his signature whirlibird thing during Seek and Destroy. Kirk… well, Kirk never really did anything outrageous on stage anyway and most of his subdued mannerisms make it into the game just fine. There are also some unlockable videos of “bootlegged” tour footage, some behind the scenes stuff from the game’s development, and a couple other fan videos, along with guest appearances by Lemmy of Motorhead and King Diamond. The game is loosely held together by a cartoonish storyline about a Metallica cover band trying to make it big, and progression and unlocking songs is as simple as getting a certain number of stars on available songs to unlock new ones. 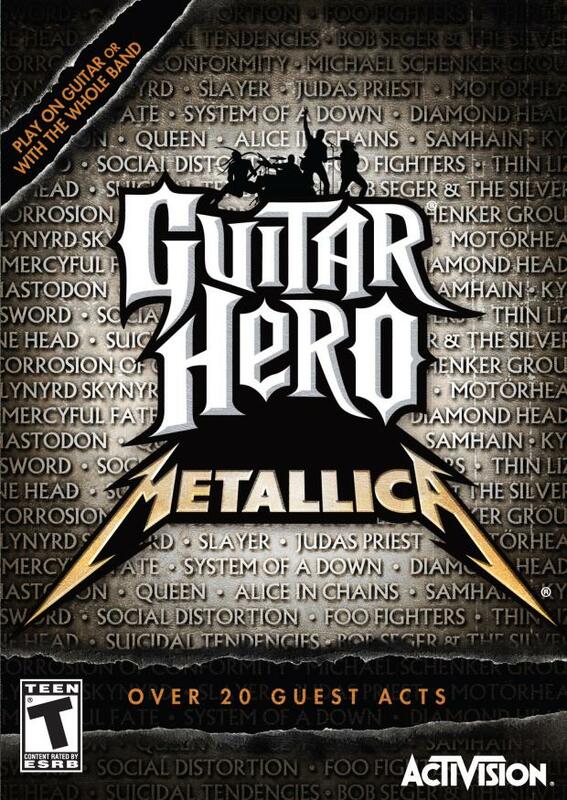 So this is not really a new Guitar Hero game by any means, it’s basically a bunch of Metallica’s songs with a few outside songs from bands like Alice and Chains, Queen, System of a Down, and even Bob Seger sprinkled in for good measure. I’d gladly trade all the non-Metallica songs for more Metallica songs, though. Aside from the cartoonish characters that make up your Career Mode band, the actual renderings of the members of Metallica are pretty cartoonish as well. The motion capture makes up for it somewhat by bringing each member’s mannerisms into the game, but it would have been cool if everyone looked more human-like. The music’s there, though, which is the most important thing. The overall gameplay is impressive, especially if you’re familiar with Metallica’s music. I’m not an awesome guitarist by any means, but playing Hammet’s parts on the medium skill level felt natural and smooth. The drumming interface is outstanding and singing like James Hetfield is actually more challenging than you’d think. All in all, everything’s really well done from a pure note-to-note standpoint. The development team did a great job with this one. If you’re a Metallica fan, buy it. You’ll love it. Everyone else might think twice before shelling out $60, as the storyline is pretty weak and there aren’t a ton of new and varied tracks compared to what you’d get with a full blown version of, say, Guitar Hero World Tour. Drummers looking for a challenging drumming experience might find what they’re looking for in this game, and drummers who grew up on Metallica should have already left for the store by now.